What are Law Graduates doing at the 2014 FIFA World Cup event at Brazil? 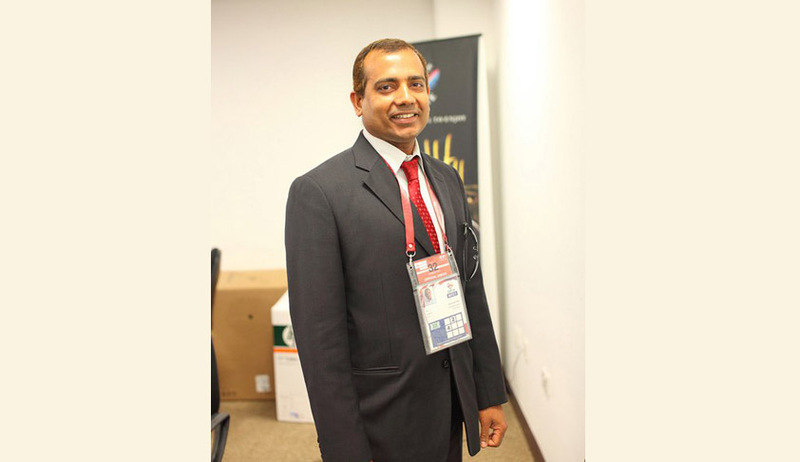 When one of their colleagues at Kollam Bar Association, Adv Mahajan Vasudevan Nair was seen at Brazil representing the Asian Football Confederation, the biggest member of FIFA family, friends were confused because Mahajan was a sportsman as well as a lawyer. Mahajan practiced civil law as a junior to the famous civil lawyer of Kollam, Adv Choottaramadom N. Venkita Subramoniya Iyer from 1996 onwards and started independent practice since 2000. He continued his practice for ten years at Kollam. He obtained Master in Sports Management Degree from University of Geneva and is currently the “Head of Club Licensing & Commercial Legal” at Asian Football Confederation at Kuala Lumpur, Malaysia. The Asian Football Confederation (AFC), which includes 47 Asian countries including Australia is the biggest member of the FIFA family. Born as son of K.Vasudevan Nair & Jyothishmathy Amma, he is married to Radhalekshmi. They have a son named Mahadev. Adv Mahajan shared his experiences and views on new avenues for law graduates in the Sports sector, in an interview with livelaw.in. Live Law : Why did you opt law? Adv. Mahajan : Right from my young days I had the habit of intervening in social issues to help out the public from the laches of the Government, especially the Police, and had developed a belief that being a lawyer will help me in the task. Live Law : Did you join LL.B Course with an intention to practice law? Adv. Mahajan : Sure. My only intention at the time of joining LL.B Course was to practice law here. I didn’t even think of applying for a Passport. Live Law : How do you feel looking back at your Law College days? Adv. Mahajan : The five years at Government Law College, Thiruvananthapuram were the best of my life. I learned more about people than law. The different situations I had dealt with there were so wide and variant, that I have not come across again. The friends I acquired from Law College remain as life long friends. I was actively involved in politics there and was influenced by the political philosophy of Jayaprakash Narayan and Ram Manohar Lohia. I was an active member of Vidyarthi Janata Dal. Live Law : Why did you leave active politics? Adv. Mahajan : I had an inclination to continue. My professional engagement gave me little time and my party had become a non entity in the political scenario in Kerala. But I still remain a committed soldier of social justice. Live Law : How was your practice as a lawyer? Adv. Mahajan : I started practice under the guidance of a famous civil lawyer at Kollam, Adv Choottaramadom N.Venkita Subramoniya Iyer. He was a very disciplined and strict lawyer who also expected discipline from his juniors. His training was so active that I had to make a brief report of the cases at the end of each day. The financial part was not very lucrative but the training I got from my senior helped me to be successful when I underwent the tests and interview for my present career. It is also of very help to me now, when I am to handle Contracts worth multimillion dollars as Head of Commercial Legal at AFC. I opted for a civil office when I started practice as a lawyer, because once you are thorough with civil litigation, it will be easy to practice criminal litigation but not the other way round. Live Law : Why did you leave the profession as a lawyer? Adv. Mahajan : After ten years of practice I started feeling monotonous, repetitive and mechanical. I decided to look into some new fields where I could apply myself. Since I was a sportsman and had experience as an organiser, I thought it fit to explore avenues in the sports sector where I will be a natural fit. Live Law : What was the turning point in your career? Adv. Mahajan : When I decided to enter the sports sector, I started researching for unexplored fields in Law. I came across this Masters Degree in Sports Administration which was a programme run by the AISTS (International Academy of Sports Science and Technology) in collaboration with the International Olympic Committee and University of Geneva. It was a one year course where one of the subjects was Sports Law. The other subjects are Sports Sociology, Sports Technology, Sports Medicine and Management & Finance. This Degree along with my previous experience as a civil lawyer helped me to attain a career in sports. Live Law : Was it financially feasible for you? Adv. Mahajan : I was financially supported by education loan, but the moral and emotional support from my family was my strength. Live Law : Can you share some experiences at Geneva? Adv. Mahajan : The members of our class included 28 Nationalities. Out of 32 classmates, five were Indians. It was like going back to my College days with an additional advantage of International exposure. Almost half of my classmates were females. I remember the day when we the Indian team beat the European teams in “Curling” organised among our classmates. Curling is a sport included in the Winter Olympics. Live Law : Are there good opportunities for law graduates in the sports sector? Adv. Mahajan : ‘Sports’ is a huge sector which contributes 3% of the World trade. The job opportunities are increasing in a high rate in India too. Sports Law is not a generic law like civil or criminal law. It needs application of civil, criminal, tort, contract, administrative and other laws. It is a comprehensive legal field of its own. I can foresee a tremendous growth in the business of sports in India and consequently Sports Laws. Boris Paul is a practicing lawyer.